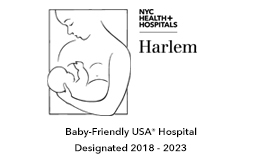 NYC Health + Hospitals/Harlem provides a wide range of medical, surgical, diagnostic, therapeutic, and family support services to the residents of Central Harlem, West Harlem, Washington Heights, and Inwood. We anticipated today’s health issues long ago, instituting wellness programs, measuring patient satisfaction, and implementing quality review programs to assure that our patients receive the highest quality health care. The hospital is a 272-bed acute care facility and a designated Level 1 Trauma Center, with a full spectrum of specialty services, including a burn unit, an adult intensive care unit, a neonatal intensive care unit, a pediatric intensive care unit, and a cardiac care unit. NYC Health + Hospitals/Harlem is the largest hospital in Central Harlem, capable of treating the most seriously ill. The Hospital provides over 90 specialized ambulatory care services, including same-day surgery in our Aubrey S. Maynard Ambulatory Surgery Unit, behavioral health services, community substance abuse treatment, dentistry, and oral surgery. We offer evening and weekend appointments, as well as, 24 hour physician telephone access for all patients.